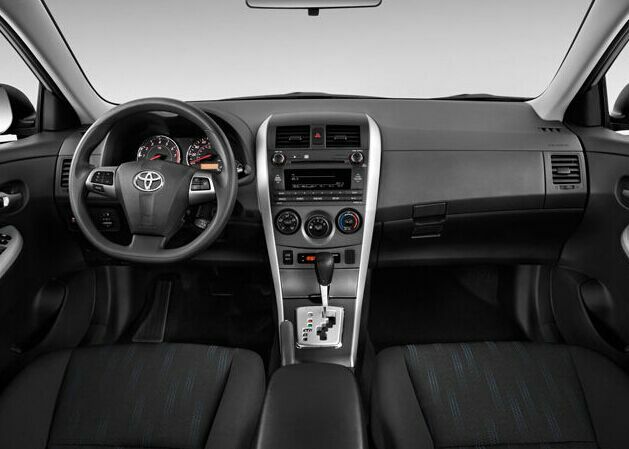 Look at this image, this is a factory radio of 2012 Toyota COROLLA. 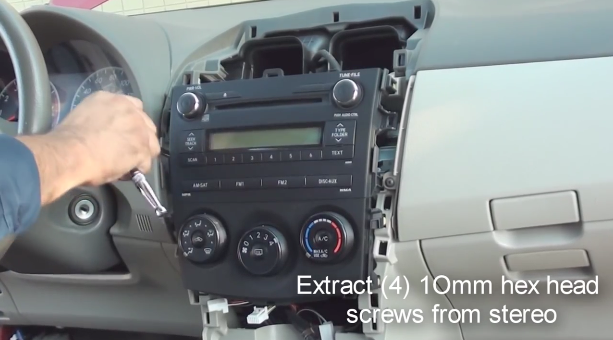 Do you have a 2012 Toyota Corolla? 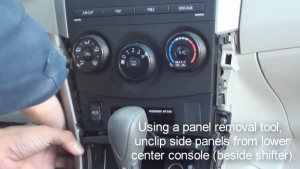 If you say yes, and you want to install a new Toyota COROLLA Radio with navigation DVD player, then you can read this blog patiently and it will tell you detailed installation steps for 2012 Toyota COROLLA radio navigation DVD player. If you have not bought a new aftermarket radio, this one can be a good choice for you. It has intelligent pure android 4.4.4 operation system and 7 inch HD 1024*600 multi-touch screen and supports dual-screen display for the highest resolution of 2048*1536. You can perform Google search on the road with quick search box, play online games, watch videos, download online data and check emails by connecting to any WiFi hotspot in range or 3g internet, download any applications in the android market for access to games, Skype, MSN, YouTube, twitter, E-Book, Gmail etc. You can set any of your favorite application icons as shortcut on the main menu and set the position of the icons according to your preference. And it is your perfect road companion. 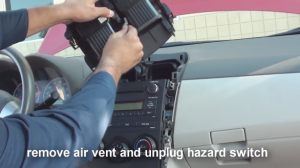 1·First remove the negative cable from the battery. 2·Then return to the inside of the Toyota Coralla, using a panel removal tool, unclip side panels from lower center console. 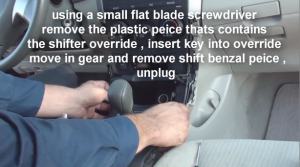 3·Using a small flat blade screwdriver remove the plastic piece that’s contains the shifter override, insert key into override move in gear and remove shift benzal piece and unplug the connectors. 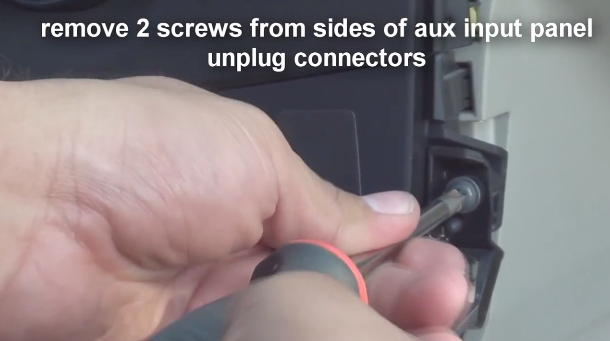 4·Remove two screws from sides of aux input panel and unplug connectors. 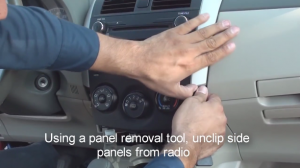 5·Using a plastic tool, unclip side panels from radio. 6·Remove air vent and unplug hazard switch. 7·Remove four 10mm bolts from stereo. 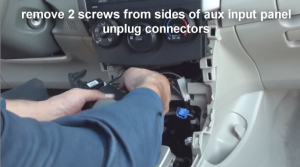 8·Pull out the radio and unplug connectors. 9·Make antennas and cables connected step by step as installation instructions show, and you should be very careful when you are doing this for it will affect whole procedure. 10·Connect the new Toyota COROLLA Radio to your Toyota Corolla, you should check your connections, the new unit’s position, and you’d better have a tidy for the cables. 11·Check whether the unit is working properly. 12·When the radio is working properly, firm four removed bolts and two screws that are put aside, then make panel back on your new unit. We have finished installation of Toyota COROLLA Radio, and your wonderful car life is starting now! 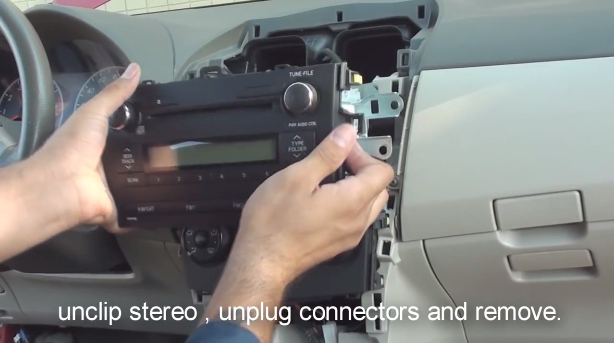 This entry was posted in Toyota car stereo and tagged Toyota COROLLA Radio. Bookmark the permalink.